The Oxford University Press just anointed the phrase ‘squeezed middle’ as its ‘word of the year’. The phrase, of course, refers to the financial pinch being felt by the American middle class in the midst of a never-ending recession. I find it ironic, though, that the Oxford word wizards would choose ones that illustrate the exact opposite of what’s happening to the population’s collective waistlines. Two recent cases in point illustrate the dichotomy. The first appeared in The New York Times and told the sad story of America’s truckers. According to Abby Ellin’s article, an astounding 86 percent of the country’s 3.2 million truck drivers are overweight or obese! And, check out this tidbit provided by Brett Blower, director of marketing and development for the Healthy Trucking Association of America. A few years back, Blower’s group conducted a blood screening of more than 2,000 truckers at an annual truck show. “We sent 21 directly to the emergency room, and one of them had a heart attack on the way there,” he recalled. Talk about road kill. Wow! At the same time truckers are dropping like flies (note: Ellin’s article blames the truckers’ sedentary lifestyle and the calorie-rich gruel served at truck stops as the chief cause of their obesity), Congress is fighting hard to undermine the Obama Administration’s efforts to take unhealthy foods out of our nation’s schools. 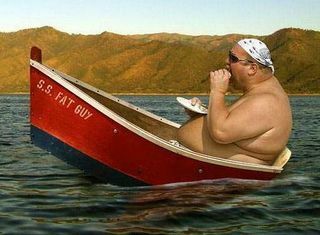 I guess knowing that most Americans today are overweight isn’t good enough for Congress; they’re thinking long-term. In fact, if Republicans get their way, the tomato paste used on pizza would be counted as a vegetable and they’d overturn efforts to limit the use of potatoes on the lunch line, put new restrictions on the use of sodium and boost the use of whole grains. It’ll be a huge win for potato-growers, frozen pizza makers and the salt industry, respectively; and a huge loss for the health and well-being of our kids. So, while I wouldn’t quibble with the Oxford University Press opting for squeezed middle as the word of the year (after all, it’s the economy, stupid! ), I would nominate a co-winner for the 2011 word or phrase of the year: ‘self-inflicted wound’. I cannot think of any other nation at any other point in history that has done more harm to itself than modern-day America. Of course, I missed Rome circa 476 A.D. and Athens about 800 years prior to that, but I can’t believe either society could compete with ours for sheer stupidity. This entry was posted in Current Affairs, Education, Fatty Fatty Two By Four Can't Get Through the Bathroom Door, Health by RepMan. Bookmark the permalink. Depends upon which Republican legislator one asks, Julie. You mean ketchup ISN’T a vegetable?